The film kicks off the 2017 Spring Season 4 of the Asian Pop-Up Cinema Series, taking place on Wednesday, March 1st, 2017, at the AMC River East Theatre in downtown Chicago. Director Yaguchi-san will be in attendance, as well as moderator Mark Schilling from the Japan Times. For complete details and to purchase tickets, click here. The day before Yaguchi-san is appearing in Chicago to represent the U.S. premiere of his latest film, HollywoodChicago.com sat down to talk – through a translator – about his unique take on a post-apocalyptic society, made funnier by the haplessness of the modern human condition, and more poignant in the consumption of cat food by his characters to stave off hunger. HollywoodChicago.com: What fascinated you about the story you wrote, in the sense of how people would react in a situation like this? Shinobu Yaguchi: In a sense, it is a moral warning to society, since we have become so dependent on technology. I am not fond of technology myself, and I do not have a smart phone. 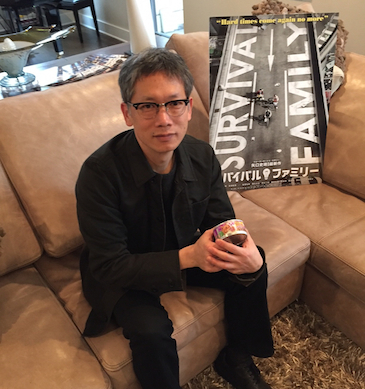 HollywoodChicago.com: What did you want to say about family life in Japan today, through the Survival Family you portray? Yaguchi-san: Similar to what I said above, without technology and without electricity there is a break up with all the technological connections that people have. By breaking their ties with everyone else, they come together as a family in this journey. HollywoodChicago.com: Two outsider perceptions of Japanese culture in the United States is one of cold worker bees and outrageous Anime. Where do you have both in your film? Yaguchi-san: Well, the main character of the father is a perfect example of the walking worker bee you described, and in that way is neglecting his family. I’m not saying that’s bad, because somebody has to bring bread to the table, but his personality is all part of that mindset. As far as Anime is concerned, I don’t watch it at all, so I can’t really make a comparison. HollywoodChicago.com: Another outside observation of Japan is that it is very competitive, but respectful of each other. We saw that competition come out, with less respect in regard to the situation the culture was in during the film. How do you think our instincts to survive become greater than what we’ve learned in life? Yaguchi-san: In Japanese society, the competitiveness is within a traditional respecting framework. The Japanese will not compete if that competition involves violence or if it is a zero sum gain – if you win, someone has to lose. Yaguchi-san: It may look chaotic, but it really isn’t…it’s not led by a small group or a leader, it comes out of the collective moving toward the same thing, and even though it does look chaotic, there is harmony in that chaos. It is thought of as sinful to be a ‘squeaky wheel’ in collective situations, but on the other hand – as was in the film – sometimes when you don’t ‘squeak’ it could endanger your family. HollywoodChicago.com: Recently, the notion of ‘Premium Friday’ [companies letting workings out early on Friday to relieve the stress of society] became an issue for workaholic Japan. Do you believe that society can adjust to more leisure, or is Premium Friday just a dream? HollywoodChicago.com: Your films ‘Waterboys, ‘Swing Girls’ and ‘Wood Job!’ are all about Japanese characters who don’t fit in to the standards of their society and culture. As a creative person, how do you relate to that? Are creative people considered outsiders in Japanese culture? Yaguchi-san: Well, I certainly have more enthusiasm when I’m dealing with marginalized people in Japan, and as a creative person I am part of that marginalization. HollywoodChicago.com: The last kind of global crisis disaster, that I could relate back to the movie, was 9/11 in 2001. What was the reaction in Japan through your friends about 9/11, and how did it change your mind about Americans? Yaguchi-san: The reaction regarding 9/11 wasn’t about Americans per se, but rather the collapse of world order. The disaster in the film was based more on earthquakes in Japan and the Fukushima nuclear plant meltdown rather than 9/11. HollywoodChicago.com: You’ve had a long and prosperous career as a filmmaker. What was the first film that you saw, that you think got you on a path to your career as creator and director? Yaguchi-san: That would be Steven Spielberg’s ‘Jaws.’ When I saw that film I felt another reality, that was created beyond the reality of the movie theater I was sitting in, and that was an impression that I never forgot. CLICK HERE for a more detailed article about Opening Night, Spring Season Four of the Asian Pop-Up Cinema Series in Chicago. Season Four of the Asian Pop-Up Cinema series in Chicago kicks off with the U.S. premiere of “Survival Family” on Wednesday, March 1st, 2017, at 7pm. The film is directed by Shinobu Yaguchi. The director will make a special appearance, moderated by Mark Schilling of the Japan Times. For more general information on the Asian Pop-Up Cinema series click here.